2019 must be the year of the jumps, and much of that is coming from Long Island. Exactly one week since another Long Islander took down the Girls Triple Jump State Record, the boys long jump record took quite a scare. Kenneth Wei (Mt. 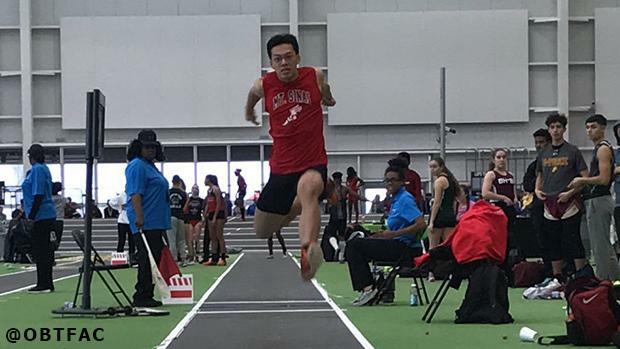 Sinai) was jumping at the Section 11 Small School County Champs, and something about the day made his legs feel ready for a big one. Wei had already made headlines earlier in the year, when he launched a then-national leading 24-0 at the Stanner Games. It was a big jump for Wei at the time. Again, his PR was 22-4.5 on December 23rd of this season. A week after Stanner, Wei came back with a 23-5, showing he was consistently over 23-feet this year. He had been tripling that day (55HH, LJ, TJ), as opposed to doubling at Stanner, so it was understandable. But Wei would be tripling at counties as well, in an effort to take the small school team title. As a side note, Mt. Sinai takes second by 12 points if you combine the large and small school meets. So it was down to Wei's last attempt, of his last event, for the big mark to come. With a giant leap, the crowd knew it was big the moment he landed. The official read out 25-foot even. It's the third furthest leap in state history, the best since Rayvon Grey (Beacon) set the state record back in 2016, and would be tied for fourth best outdoors. It was another full foot of a PR for Wei, doing so on tired legs. Nationally, he is the new state leader, joining only a handful of athletes to break 25-feet in the last decade. It also makes him US No. 19 all-time in the event. Wei may have an opportunity to jump on fresh legs before States and Nationals, despite being competitive in both the Hurdles (NY No. 4) and Triple Jump (NY No. 4) as well. His mark exceeds the A-standard at USA Indoors, held at Ocean Breeze. If he so chooses, Wei will have auto-entry into the event, and could compete against some of the best in the world.